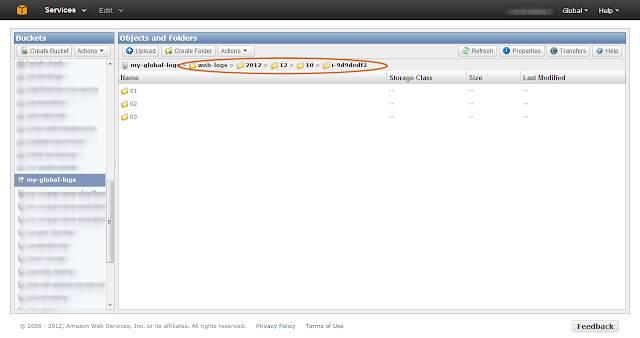 In this post, we will see how to push logs from the local storage to the central log storage - Amazon S3 and what the considerations are. The logs are going to be generated throughout the day and hence we need to have a proper folder structure to store them in S3. Logs will be particularly useful to perform analysis such as a production issue or to find a usage pattern such as feature adoption by users/month. Hence it will make sense to store them by year/month/day/hour_of_the_day structure. Note in the above picture (as encircled) that we are storing "Instance" wise logs for every hour. Every logging framework will have an option to rotate the log files on size, date, etc...We will be periodically pushing the log files to Amazon S3 and hence it might make sense to say, rotate the log file every hour and push it to S3. But the downside to that is, we cannot anticipate the traffic to the web tier and that's the reason we have the web tier scaling automatically on demand. If there is a sudden surge in the traffic which may result in large log files generated, it will start filling up the file system eventually making the Instance unavailable. Hence it is better to rotate the log files by size. The above set of commands rotate the "httpd" log files whenever the size reaches 50M. It also calls a "postrotate" script to compress the rotated file and upload it to S3. The next step is to upload the rotated log file to S3. EC2_INSTANCE_ID="`wget -q -O - http://169.254.169.254/latest/meta-data/instance-id`"
echo "Error: Couldn't fetch Instance ID .. Exiting .."
Now that the files are automatically getting rotated, compressed and uploaded to S3 there is one last thing to be taken care of. Since the web tier will automatically scale depending upon the load, Instances can be pulled off (terminated) when load decreases. During such scenarios, we might be still left with some log files (maximum of 50MB) that didn't get rotated and uploaded. During shutdown, we can have a small script, that will forcefully call the logrotate to rotate the final set of files, compress and upload. echo -n "Force rotation of log files and upload to s3 intitiated"
With that we have the web tier log files automatically getting rotated, compressed and uploaded to Amazon S3 and stored in a central location. We have access to log information by the year/month/day/hour and Instance-wise.